Smelly laundry is quite common in this household. This post is brought to you by Global Influence Network. All opinions are my own. With two playful dogs, a hard working hubby, and just life in general, laundry can get a little stinky around here. My Grandmother used Tide exclusively all throughout my childhood. She still does to this day and you can definitely say that she is super brand-loyal. When it comes to extra stinky laundry around here, I know that I can count on Tide. Some loads of laundry just need a little extra help than others. For example, Mike just brought in a whole bunch of laundry from the garage. The GARAGE. They have been in there festering for the entire winter. Included in this batch were previously-wet beach towels. Clearly, I need to supervise our garage more carefully, but I can say that this is a first! I was ready to pitch the beach towels because they smelled so badly. Thank goodness I didn’t because Tide Simply Clean & Fresh revived them. No more mildewy nasty stench, and back to usable beach towels. The clothes and other items were nice and clean, as well. Tide Simply Clean & Fresh has 2X the cleaning and odor-fighting power of the leading detergent with baking soda. The formula is designed to get to the source of the odor and thoroughly clean deep down into the fibers. It doesn’t just cover up the odors, it removes the nasty particles from the garments. There’s enough to do in a day and laundry should not be a stressful chore. I swear the laundry pile seems to breed because I don’t know how two people can create so much of it. Using Tide Simply Clean & Fresh assures me it will get properly done in one cycle, and come out smelling amazing. Make sure to check out the two new scents: Refreshing Breeze and Daybreak Fresh. It’s HE compatible to work in any machine. It’s available nationwide with an affordable suggested retail price of $4.99-$5.99 for a 50 oz. bottle. (Pricing is the sole discretion of the retailer). How do you tackle super stinky laundry? Have you tried the new Tide Simply Clean & Fresh yet? i need this for my exercise pants! I have two very smelly little boys (not to mention a sometimes smelly husband), so this sounds like it would be perfect for us! I have some of that actually and really like it! It most definitely does leave a fresh and clean smell in the laundry! I love the price point! Tide can get very expensive to buy! I got a bottle yesterday but haven’t tried it yet, I am sure it is amazing! 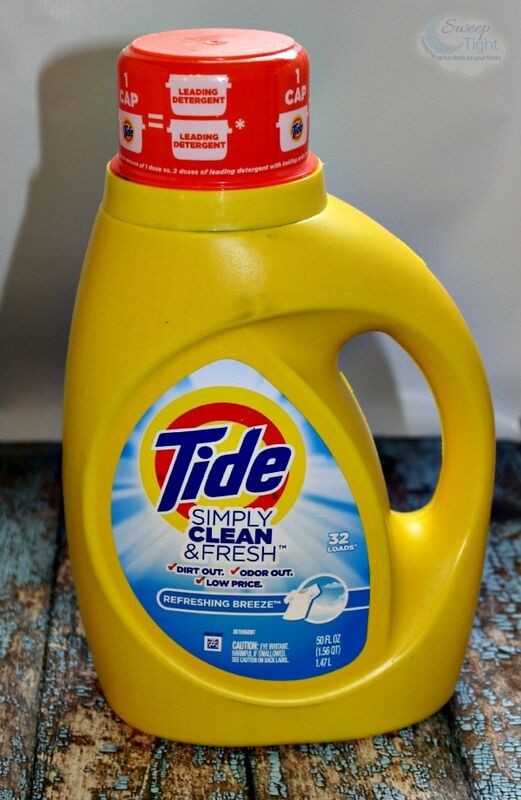 Love Tide, I have not tried this one yet, I need all the help I can get with my 5 kids laundry! I’m a Tide fan too. My mom and mother-in-law use Tide exclusively. Doesn’t matter if they have a coupon or not. I’ll get sucked in with a competitor coupon, but always go back to Tide! 🙂 Can’t wait to try Simply Clean & Fresh. I have pretty much always used Tide but I don’t think I’ve tried this version! Thanks for suggesting it, I am going to have to pick some up! This stuff works wonders on my hubbys work clothes, which I’ve had problems with for years. happy to have finally found something that works! I hate it when I find wet clothes somewhere. I seem to usually find them in the car, of all places. That stuff smells so good! I haven’t tried this yet but I need to. My husband and son sheared our sheep recently and I swear that laundry is never going to smell the same again! I haven’t tried this new Tide. I have a small supply of the orange bottles of Tide, I’ll use them up and then check out this scent. I have teenagers, so my laundry is very smelly! Our toughest laundry is my youngest son’s. I generally use extra detergent and then dryer sheets and cross my fingers. I love all of Tides products, can’t wait to smell this one though. Thanks for sharing. You gotta love good detergent that is a great deal as well! I love the smell of this stuff! I think I’ll give this detergent a try! We have highly sensitive skin in my family so I’m always cautious of what to try. It’s amazing how much technology goes into making clothes smell clean and look good. Some of the new detergents are amazing. i’m always up for trying a new detergent. tide has been around so long, it got to be good! Oh I haven’t seen that variety of Tide yet. I would love to try it. I will look for it next time I go to the store.